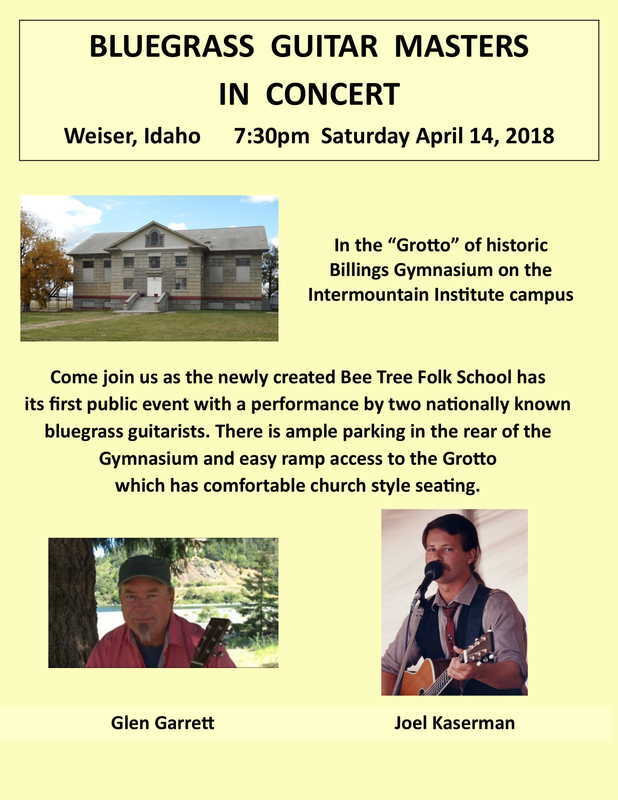 The Weiser guitar camp will be held April 13th and 14th. Instructors are Glen Garrett, Austin Clark and Joel Kaserman. Glen will head up most of the Friday sessions, which will concentrate on rhythm guitar. Joel will help out and put in his two cents. Joel will head up most of the Saturday sessions, which will concentrate on lead guitar. Glen will help out and put in his two cents. By the end of the weekend, you will be at least four cents richer in your guitar playing! We will all be choosing tunes and songs to use these techniques on. Please bring any specific ideas you have about tunes and songs you want to work on. Question and answer periods are a natural part of any workshop and questions are encouraged at all points during the weekend. That’s what we are there for. We will have a scheduled Q&A session to end each day’s instruction. 1. Right and left hand techniques. 2. Capo use - when and where and why. 3. Picking out melodies - follow the changes or stick to the root? Don’t forget the rhythmic aspect. 4. Connecting melodies and licks to chord shapes. 5. Licks and tricks - things you can do to make your playing more interesting, or to give you an automatic exercise moment to think ahead about what you want to play in a tune. 6. How to use jamming to help your advancement and practice without being obnoxious.